Silent Forest is an installation in an abandoned trolley station beneath Dupont Circle in Washington DC. In its current condition, this forgotten space is mysteriousand catacomb-like. The installation explores the trolleys station’s characters through an expression of being in a forest during full moon where it is dark, mysterious and fascinating at the same time. In mythologies, forest is enchanted. 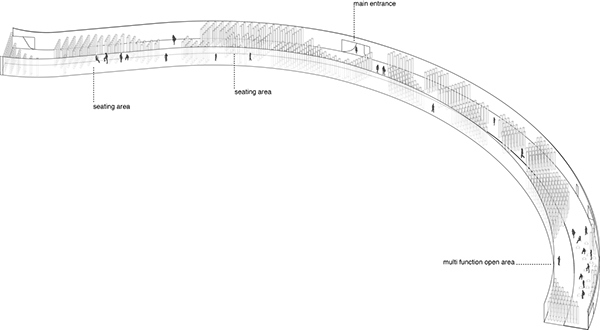 It acts as a place of transformation and offers an outside human experience. This installation symbolically is a transformation of the station’s life and it offers visitors with experience that is outside their normal expectation. The experience starts after visitors coming down leaving their familiar world behind and entering the installation. The sense of tranquility provided by ‘trees’,‘moon light’ and silence welcome them. 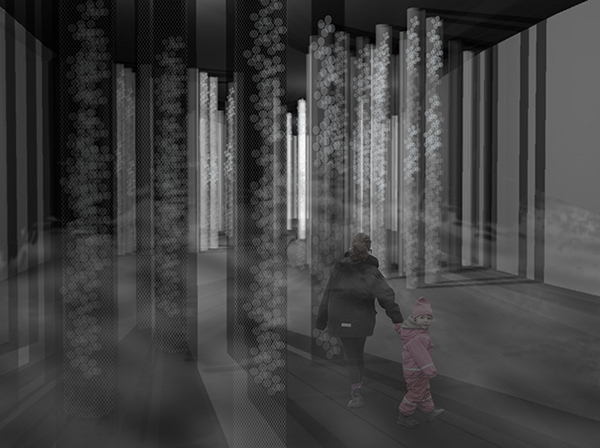 The ‘trees’ are the series of columns made out of wire mesh filled with white, translucent plastic balls are being projected with spotlights then add the fog from the smoke machines, creating interesting shadows and light play as visitors start to wander around. The trails in the Silent Forest are maze-like and they lead to each end of the installation where sound installations of wild animals’ voice are installed in low volume. This will trigger visitors’ curiosity and they will look for the source. Along the trails, seating will be provided. Some are in an open area and some are nestled between the ‘trees’ creating more intimate space. The open area can also be transformed into a small talk and discussion space or an intimate curated acoustic performance with flexible layout of seating. The white plastic balls will be the prominent material as they will filled the holders that are shaped into the columns and seating. These holders will used modular wire mesh that will be hang onto the ceiling. 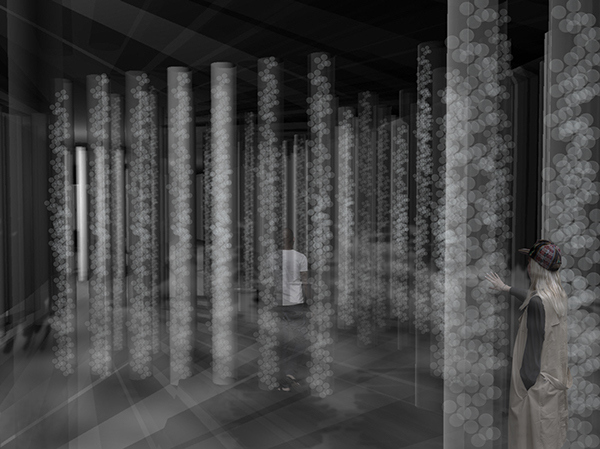 For an effective construction and enough opaque-ness for light to pass through, all columns and seating are 1-foot diameter cylinders made out wire mesh vary in heights. They will be placed along the grid of 4 x 1.5 feet. 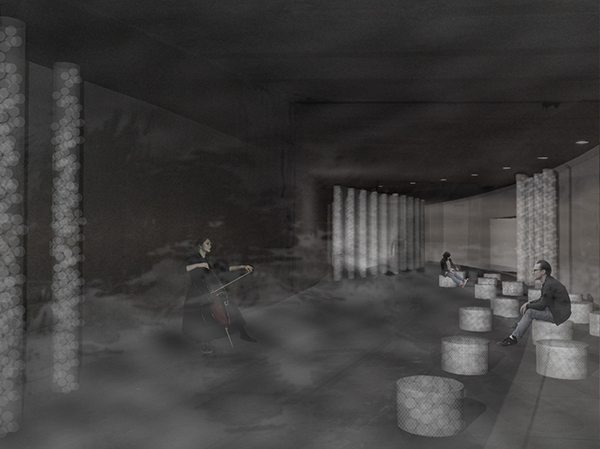 The spotlights will be projected to the columns and will be placed on the tiled wall side to conceal the tiles and highlight the raw concrete wall on the opposite site.The smoke machines will be place strategically to provide enough fog for the space.